The South Korean manufacturer has presented the second generation of its Genesis luxury sedan at the North American International Auto Show (NAIAS) in Detroit. A showcase of Hyundai’s latest developments in terms of both technology and luxury features, the 2015 Genesis will roll onto US dealerships in the coming months. The 2015 Genesis will be the first Hyundai vehicle equipped with HTRAC, an advanced AWD system aimed at optimizing performance and stability. Among the numerous high-tech safety features on board are a blind-spot detection system, lane departure warning system, automatic emergency braking, “smart” cruise control, forward collision warning and head-up display. The Genesis also features an innovative CO2 sensor within the cabin. Located under the glove compartment, the sensor monitors the cabin air and activates a ventilation system to ensure that CO2 concentration remains well below 2,000 parts per million, the level at which occupants have been known to experience drowsiness. 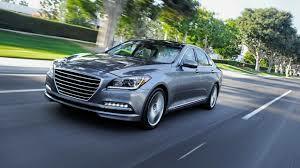 In North American and Asian markets, Hyundai will offer the 2015 Genesis with a choice of 5.0L V8 engine with 420hp or 3.8L V6 engine with 311hp. Hyundai also plans to market a limited number of 2015 Genesis sedans in Europe, but only with the premium trim package.